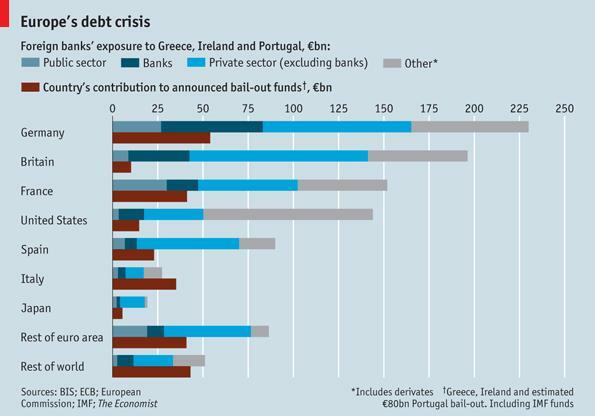 Great chart from the Economist of foreign bank exposure to Greece, Ireland, and Portugal (GIP) and explains why “restructuring” is so taboo with European policymakers. The Greek sovereign credit curve is inverted with the 2-year now yielding around 18 percent and the 10-year with a 13 percent handle the last time we checked. The inversion is usually a signal of default as investors/traders start worrying more about absolute price of the bond and potential downside rather than yield. A bond trading at 97, for example, which matures at par (100) in 30 days yields over 35 percent on and annual basis. A 5 percent coupon 1o-year bond trading at 55 has an annual yield of 13 percent. Note which bond has more downside if the issuer defaults and the recovery value is, say, 45. Witness the inversion. We’re not so sure global markets will yawn if Greece defaults and are much too complacent (x/ gold) with what is happening in Europe, in our opinion. Stay tuned. This entry was posted in Euro, Fiscal Policy, PIIGS, Sovereign Debt, Sovereign Risk and tagged European Soveign Debt Crisis, GIP, Greece, Ireland, PIIGS, Portugal. Bookmark the permalink.